This was on my todo list for such a long time – making ‘good’ samosas! I mean given that good samosas are a common phenomena back in India, its surprising that not even a single store in America, yes not even a ‘single’ store, makes good samosa. The most common mistake they do is to fry them in over heated oil rendering the samosa surface full of blisters and scalds. Comeon! be little more kind to it, what harm have they done to you? If not that, then the crust is so thin, that you feel you are eating flakes filled with potatoes. And on the topic of potatoes, most of them even dont know how to make an edible filling for samosas. Some hash the potatoes, some fill it with diced ones, and yet some other add things like corn, carrots, beans etc. If anyone of you out there is reading this! please please please DONT add vegetable other than potatoes and peas! Thats all you have to do. And dont hash or dice the potatoes, try simple mashing with hand. Finally, please dont make samosas as if you are feeding the feeble heart! Add spices to it. Generously!. Enough of rant. Motivated by a really close friend of mine, it was the right opportunity, that being my roommates birthday, to put money where my mouth was. Yes we (Himanshu and me) made ‘good’ samosas this weekend. Its not that difficult after all. You just need to love making and eating samosas. I am sorry I cant let you taste for yourself, but you can definitely relish it visually. Some new learning from the process too. First, not to make the dough from coarsely ground flour. It will lend the samosas a little granular taste and make it visually less appealing. Second, not to make the crust too thick either, as it spoils the holy balance between filling and crust. Other than that!Happy Samosas! An interesting application for what I do. I work in image retrieval, the basic idea being finding images similar to a given query image. This can be posed in three different forms. First, find me images which are only near duplicates of the query image. Second, find me images that are visually similar (color, texture, etc) to the query image. And third, find me images that have the same concepts (birds, tree, ground etc) as those of the query image. All of them are interesting problems in themselves, with the degree of difficulty increasing from one -> three. Although there is an evident application to this, that being image retrieval itself, but I just saw this application that makes an interesting use of the first two solutions – Image Comparer. It allows one to refine similar images or pictures he has in his collection, saving us the trouble of finding similar images. I installed and tried this software, but not unexpectedly was not impressed with the output. For sure it does not have the capability of finding similar images at semantic level, it does not even work at the visual level. Maybe its good for near duplicate images, which I am not really interested in. Nevertheless, I will give them kudos for the idea. Doing something different, something creative, something adventurous has always been our motto. Let not funny faces befool you about the seriousness of the trip. It was a pretty darn serious trip, excusing the actors. The idea was simple. We drive. Thats it. We had the car for a day, and we drive for a day, 29 hours to be precise. East was calling us. Our inital estimate was to do 60mph on average, ride for 29hours, and cover atleast 1200miles. Making a Collage using Photoshop Actions. My sister completes her two months of married life. 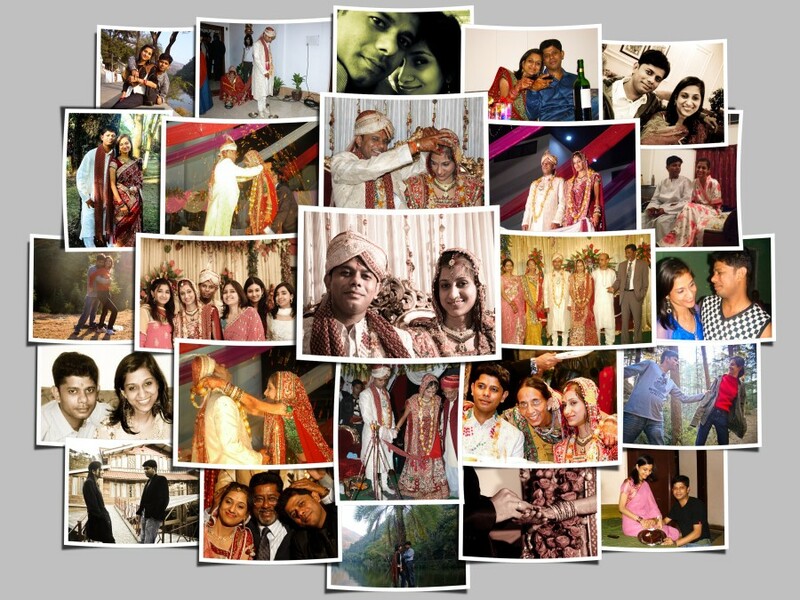 To mark this occasion she wanted to give jijaji a collage of photos from when they first met. Se sent me 25 photos in all, to make a good collage out of them. This is what I came up with. As anyone with a minimal observation faculty would notice, making this or for that matter any collage, has a major repetitive component. Every image needs to be imported into a central file, resized, and pre-processed. In this particular case, I wanted to give a border to each image and a 3-D effect with the shadows so that the photos pop up. The obvious solution is to use photoshop actions, but why reinvent the wheel. Luckily I found this action (Updated Link: page, software) online which was assembled to generate the same effect BUT it worked only on a single image and moreover divided that image into 25 parts. This is where my abilities got in :). To completely automate the process, the solution I came up with was – using photoshop contact sheet automation process (Automate II). This allowed me to create a single image out of many images. Just set some parameters and voila one has an image with 25 sub-images of equal size. Next the single image was feed to the action and it created a sub layer for each picture, added the borders, and gave it the 3-D popout effect. If one chooses, that could be an end it itself, but having all 25 images of the same size was not what I was interested in. Moreover some images were portrait orientation, that meant little more work. In the final ‘creative’ step of organizing the photos – a step where one could actually spend time on the real part rather than the mundane mechanical one, these photos were then arranges with a meaningful order.